Our organic Amla Oil is made with organic sesame oil & dried Indian gooseberries. Has been used for centuries in Ayurvedic medicine to thicken & condition hair. Our Rose & Sage Shampoo gently cleanses and nourishes you hair strands. This luxurious shampoo was created to cleanse without stripping while intoxicating you with the relaxing & invigorating essences of roses & sage leaving your luscious strands soft and smooth. 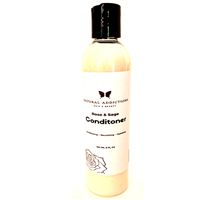 Our Rose & Sage Conditioner smoothes hair strands instantly. Rose extracts & essences hydrates and nourishes, while fortifying and protecting hair. Strengthens hair while nurturing healthy hair growth. Marshmallow extracts enable easy detangling. Our Growth & Rejuvenation oil is a harmonious botanical infusion of natural & organic plant and vegetable oils that are used to promote and stimulate healthy hair growth. Can be used daily on wet or dry hair. Use it daily or as a hot oil treatment. - Concentrated infusion of all natural plant based oils that promote thicker, healthy hair growth. - Adds a protective barrier to reduce heat damage from blow dryer. Sheer Joy Shea Hair & Body Glaze is a specialized blend of shea butter and essential oils excellent for hair and body. Sheer Joy promotes healthy hair growth and provides moisture to dry & damaged hair and helps fight frizz. It make hair soother & softer. This uniquely formulated shea glaze can be used on hair & body. Can be used on natural or relaxed hair. Great for beards and 360 waves also. Our Orange and Hibiscus Shampoo and Conditioner set gently cleanses, conditions, and nourishes you hair strands. This luxurious shampoo and conditioner was created to cleanse & hydrate hair strands while intoxicating you with the aroma & invigorating essences of orange blossom water leaving your luscious strands soft, shiny, and smooth. Our Rose & Sage Shampoo and Conditioner gently cleanses, conditions, and nourishes you hair strands. 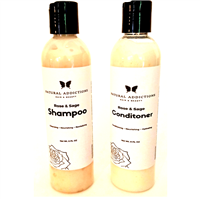 This luxurious shampoo and conditioner was created to cleanse without stripping while intoxicating you with the relaxing & invigorating essences of roses & sage leaving your luscious strands soft and smooth.